Great space to accommodate your family & friends in style in this light-filled 9-bedroom, 9-bathroom oceanfront home. The white beadboard paneling and wall colors bring a classic coastal feel to the interior of this well-kept property. A large great room is open to the kitchen, and there is plenty of seating for relaxation and meals. Meal preparation and cleanup gets a big boost with two new refrigerators and two dishwashers – plus the center island offers extra counter and eating space. On the main level, a covered porch runs the length of the back of the house and overlooks the heated pool, the beach and out to the Atlantic’s horizon. Seven of the nine bedrooms have private baths and the other two have nearby bathrooms, which are also accessible to common areas. Three bedrooms are located on the main level; the other six are upstairs - three on each side of a middle sitting area. The upstairs ocean-side king bedrooms all have doors to the covered balcony on this level. Every bedroom has its own TV, plus there are large flat-screen TVs in the great room and upstairs sitting area, and 300MB Wi-Fi throughout. Other features include an outside shower with a dressing area, plus a shower on the private boardwalk to rinse away sand. There are two charcoal grills. Pool heat is available October - May $75/day. The house sleeps 25: 3 king bedrooms; master bedroom has a pack n play, one queen bedroom; one bedroom with a queen and a twin, three bedrooms with two double beds in each, and one room with two twin beds. Linens provided for weekly rentals only. This is a non-smoking property and pets are not allowed. Ideal for family reunions, church and golf groups. The property can be used to host weddings or events with up to 50 people in attendance. For more information on hosting an event and fees involved please contact Sloane Realty. Linens will be provided, all beds will be made and one towel, hand towel, wash cloth will be provided for 25. This house was perfect for our group of friends visiting the beach in the winter. Plenty of room to spread out but also tons of space for cooking and eating as well as common space for talking and playing games. The view of the beach from the porch, living area and front bedrooms are fantastic. We had the misfortune of visiting during the longest and coldest cold snap on the NC coast in a century but we were able to enjoy the views from inside the house and a few brave folks even got out to walk on the gorgeous, quiet beach. The property managers were very attentive to us during our stay. At one point a pipe burst to the outdoor shower (since it was about 20 degrees out) and maintenance was there to fix it within 20 minutes after I reported it. Someone else came by the next day to check on us as well to make sure there were no further issues. I'm sure this is an amazing house to visit as a summer rental but it was a great winter stay as well! I can also report that the heat works great because we were definitely there at a time that put it to the test! We have been coming to OIB for several years looking for the perfect house for our family vacation. This year we found it at Family Tides!! It is spacious and beautifully decorated. The well equipped kitchen has everything you need plus all cabinets and drawers are labeled for easy access and put away!! The dining area has plenty of room for our family. There are 2 decks that overlook the ocean, beach and pool deck. Pool is a good size too with plenty of seating. The carport area has a charcoal grill and large picnic area and plenty of space for kids to play on a raining day. We have already booked for next year and looking forward to our to our 2018 family vacation! So hard to put into words how spectacular this home is and the part it played in the best vacation of my life. I had a dream….for 4 years I dreamed of a vacation with my daughters and their families and my parents at a beach house on the Atlantic Ocean. I searched and searched and searched and searched and I found “Family Tides”. The name itself leant itself to my dream. When the time finally arrived to book it, we decided to throw in a wedding! So a 7-day rental turned into a 9-day rental and family history was made. This home has absolutely anything and everything you need to make your dreams come true, too. Everyone (and we had a full 25 for the wedding weekend) was so impressed with their individual rooms. All the beds were comfy and only 2 rooms (1 per floor) didn’t have their own bathroom although they were right out the door. Most rooms also had direct access to a deck. If you wanted privacy, you had it and the large gathering areas were magnificent. The sectional in the great room was what sold me on this place. At one point, we had 9 people on it, 2 were lying down and there was still room for more. We were all able to gather together for meals as there was seating for 26. As long as we’re talking about the meals, let’s talk about the kitchen. The 2 refrigerators, 2 dishwashers and 3 coffee pots were lifesaving. I’ve been in other rental properties yet none were as well stocked as this one. I had plans to make chocolate chip cookies with my grandchildren and wondered if I’d need to purchase cookie sheets….NOPE. Cookie sheets ? Plates, glasses, flatware for 25+ ? Champagne glasses ? Wine glasses ? Plastic glasses for poolside beverages ? Coffee pot ? Roasting pan ? Large electric griddle ? Pots and pans ? Baking dishes (every size imaginable x3) ? Plastic ware to store leftovers ? Cutting boards ? Kitchen utensils ? Knife block ? Serving dishes/platters ? You need it, it’s there. Annnnd, all clearly labeled to easily find and return for the next guests’ use. Yes, you’ll need to bring your own spices and condiments to go with your food choices but you should expect to do so when you rent a home. As it was early April when we were there, we heated the pool and the kids practically lived in it. The “noodles” provided were a joy to my littles. We also made a point of having 1 full beach day and were so thankful for the beach chairs and most incredible sand castle making kit I’ve ever seen. So much fun beachcombing and we had an amazing kite-flying experience. We loved all the seating options on the decks. We could get together at a large table or escape to our own little corner for a cup-o-joe and enjoy the view. Nothing was overlooked by these owners when they prepared this place for you. We arrived with intentions to explore the island yet we only left for provisions and hurried right back. Now, let’s talk about that wedding. My daughter had dreamed of a Hawaiian beach wedding yet sometimes your dreams are bigger than your pocketbook. That’s what prompted me to ask if she’d like to get married here. All of her dreams were exceeded. Family Tides proved to be the best choice we could have made. We used the parking area under the house for the reception and it was GORGEOUS! We had room for all our guests, the food & drink, cake and even a “dance floor”. Plus, when the bride and groom arrived on Day 1, they were greeted with an abundance of filled, glazed croissants, frosted brownies [I still don’t know how the owner found out their last name (Leonard) as the brownies had the letter “L” on them] and a couple dozen cupcakes along with a beautiful wedding card from the owners. We were all blown away by the kind gesture and happily enjoyed the treats for many days. They certainly came in handy when we celebrated my granddaughter’s birthday on Day 2 of the trip. Okay, I will somehow try to whittle down my pictures from the thousand that were taken to share with you the beauty and joy of this place. My family and I will be forever grateful to Eric & Amy for allowing us to make lifelong memories at their beach house. My siblings and parents and I have been inspired to plan a vacation for us. We’d pick this place in a heartbeat if the majority of the family didn’t live on the west side of the country. If you’re looking for the perfect place to get away from it all, pick “Family Tides”. I promise you won’t regret it. Our family all gathered here for Christmas weekend. There are 25 of us, with the grandchildren. The weather was warm enough to walk the beach. The kids enjoyed the heated pool. The house had everything we needed and it was very clean and comfortable. It was a Christmas to remember! 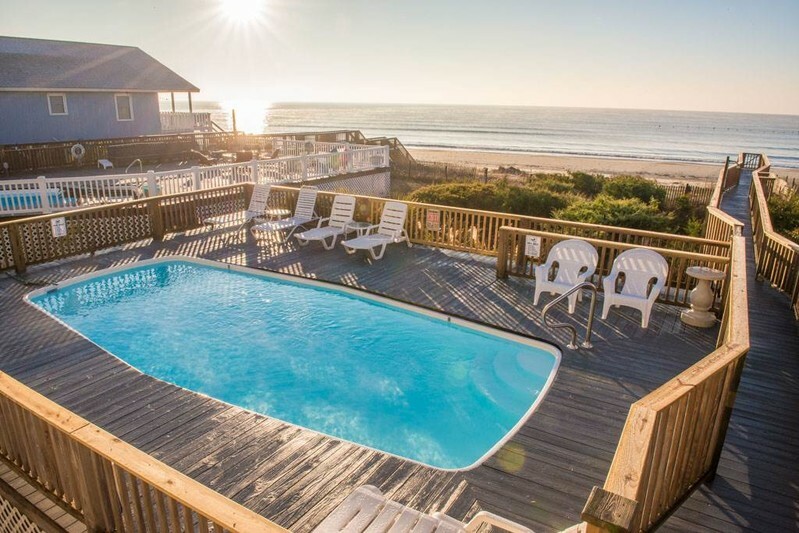 We are a group of 6 couples who have vacationed at Ocean Isle Beach for over 20 years staying in many different homes and when we found 410 East 2nd Street, known as Family Tides, we knew this was the best ocean front vacation home on the beach! It is beautifully decorated throughout, has a super big kitchen, 2 large dining tables, a huge island with even more comfortable seating, 2 dishwashers and 2 fridges, and really gorgeous bedrooms throughout. This house is so comfortable, has the million dollar ocean front view with pool and deck. We have rented this wonderful home for the past 6 years and will return again! Last year we mentioned that a porch ceiling fan would be great, and there it was this year! This really is an awesome vacation home!